One of the highlights of the Raith Rovers performance at Celtic Park last Wednesday was young midfielder Ross Matthews. The 19-year-old was handed only his third competitive start in the League Cup tie but he showed no fear as he mixed it with Celtic and Scotland captain Scott Brown in an impressive display. “It was a great experience,” Matthews told the Press. “Since I was young I dreamed of playing at places like Ibrox and Celtic Park and I’ve done both this season. “I’m disappointed with the result because I thought we played well. We really had them rattled for a good 10 minutes in the second half and I probably should have scored. I’ll have nightmares about that. Matthews’ previous first team starts came at Dumbarton and Stenhousemuir but the teenager was not overawed by the Celtic Park surroundings - nor the verbal intimidation from Scott Brown. “I was definitely ready for it,” he said. “I knew I was up against top midfielders in Kris Commons and Scott Brown and I thought I did alright. Scott Brown was in my ear the whole game, and I was happy to get a couple of tackles in on him. 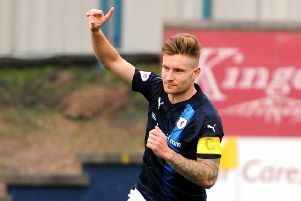 Raith boss Ray McKinnon was full of praise for Matthews performance after the game - and even compared him to the Celtic skipper. “That’s the sort of player I am,” he said. “I’m a defensive midfield player. I like to make tackles and get the ball. Matthews hopes that his performance against Celtic can convince the manager that he deserves more starts in the Championship. The outcome of the tie was in doubt up until Celtic scored a late second, which was testament to Raith’s gallant performance. After falling behind on 32 minutes to a trademark Commons strike, Rovers continued to make life difficult for the Scottish champions, and had chances to equalise, before Stefan Johansen made sure of Celtic’s place in the quarter-finals with an 87th minute breakaway goal.